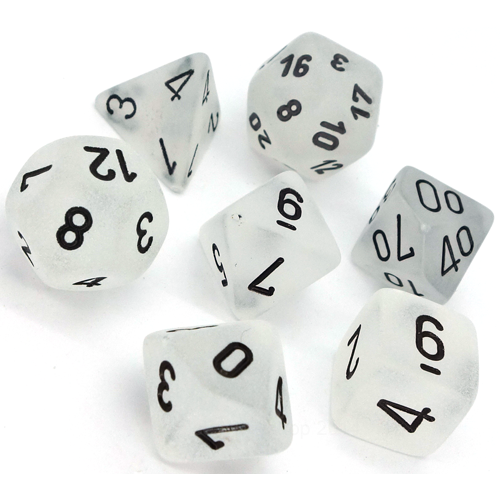 A clear and black Frosted seven dice polyhedral dice set by Chessex. Including one D4, D6, D8, D10, D12, D20 and a percentage dice. 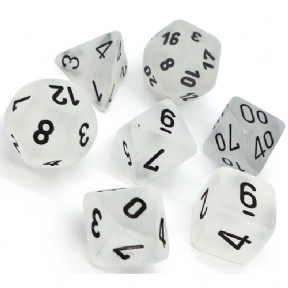 A clear and black Frosted seven dice polyhedral dice set by Chessex - a high quality dice manufacturer. Including one each of a D4, D6, D8, D10, D12, D20 and a percentage dice. These dice are of the standard 16mm size normally used for boardgames and roleplaying games. Traditionally known as an RPG dice set.